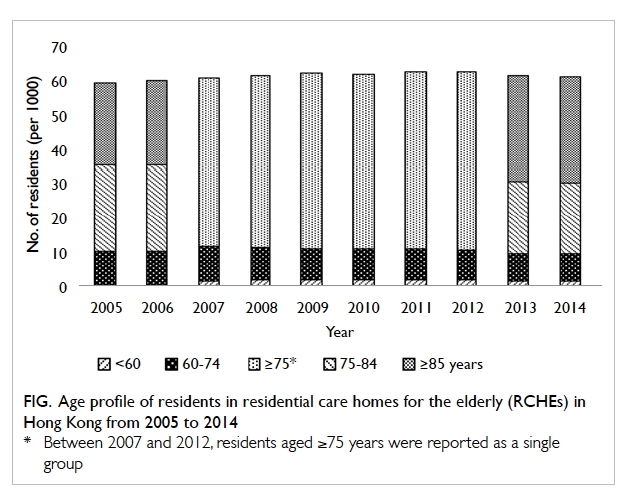 Introduction: This serial cross-sectional survey study aimed to review the trend in various infection control practices in residential care homes for the elderly (RCHEs) in Hong Kong from 2005 to 2014. Methods: Annual cross-sectional surveys were conducted at all RCHEs in Hong Kong, including self-administered questionnaires, on-site interviews, inspections, and assessments conducted by trained nurses, from 2005 to 2014. In all, 98.5% to 100% of all RCHEs were surveyed each year based on the list of licensed RCHEs in Hong Kong. Results: There was a substantial increase in the proportion of RCHE residents aged ≥85 years, from 40.0% in 2005 to 50.2% in 2014 (P=0.002). The percentage of RCHE residents with special care needs also increased, from 22.3% in 2005 to 32.6% in 2014 for residents with dementia (P<0.001) and from 3.4% in 2005 to 5.0% in 2014 for residents with a long-term indwelling urinary catheter (P<0.001). The proportion of RCHEs with separate rooms for isolation areas ranged from 73.6% to 80% but did not show any significant trend over the study period. The proportion of RCHEs with alcohol hand rub available showed an increasing trend from 25.4% in 2006 to 99.2% in 2014 (P=0.008). The proportion of health or care workers (who were not the designated infection control officers) passing skills tests on hand washing techniques increased from 79.2% in 2006 to 91.5% in 2014 (P=0.02). An increasing trend was also observed for the proportion of infection control officers who were able to prepare properly diluted bleach solution, from 71.5% in 2005 to 92.2% in 2014 (P=0.002). Conclusions: For infection control practice to continue improving, more effort should be made to enhance and maintain proper practice, and to mitigate the challenge posed by the high turnover rates of healthcare workers in RCHEs. Introduction of self-audits on infection control practices should be considered. From 2005 to 2014, among residents of care homes for the elderly, the proportion of those aged ≥85 years increased significantly. If this trend continues, the prevalence of co-morbidities and functional impairment will also continue to increase, leading to further infection control challenges. There have been improvements in infection control practices among residential care homes for the elderly in terms of manpower, facilities, practices, knowledge, and skills. The most obvious improvements have been in terms of manpower and facilities; more nurses and health workers were recruited, and more residential care homes for the elderly had made alcohol hand rub available. Correct hand washing techniques among health or care workers, availability of alcohol hand rub, and knowledge on the correct method to prepare diluted bleach solution have also improved over the years. Improvements in infection control knowledge and skills among staff of residential care homes for the elderly have seemingly reached a plateau. Future infection control training should aim to support sustained compliance with proper practices, through the introduction of elements such as self-audits. In 2016, 8.1% of elderly population in Hong Kong resided in non-domestic households (ie, residential care homes for the elderly [RCHEs], hospitals and penal institutions, etc).1 Residential care homes for the elderly are a heterogeneous group of institutions that provide varying levels of care for elderly people, who, for personal, social, health, or other reasons, can no longer live alone or with their families. There is a mix of government-subvented, self-financed, and privately run RCHEs in Hong Kong. All RCHEs must be licensed under the Residential Care Homes (Elderly Persons) Ordinance. The RCHEs operate according to the code of practice (COP)2 issued by the licensing authority. The COP sets out guidelines, principles, procedures, and standards for the operation and management of RCHEs. A chapter in the COP is devoted to infection control, requiring the RCHE’s operator to designate an infection control officer (ICO). The ICO must coordinate and implement infection control measures within the home according to the infection control guideline issued by the Centre for Health Protection of the Department of Health.3 Operators of RCHEs are required to report specific infectious disease cases and outbreaks to the authorities. Eighteen visiting health teams (VHTs) are established under the Elderly Health Service of the Department of Health in Hong Kong. Comprising 47 nurses, the teams reach out into the community and residential care settings to conduct health promotion activities for the elderly people, and carers of elderly people, aiming to increase the health awareness and the self-care ability of elderly people, and to enhance the quality of caregiving. The first on-site assessment covering all RCHEs in Hong Kong on infection control performance was conducted by VHTs between August and October 2003 as an enhanced measure in response to the severe acute respiratory syndrome (SARS) outbreak. Since then, annual assessments have been conducted by VHTs to assess and monitor the effectiveness of infection control measures and to identify the training needs of healthcare staff working in RCHEs, so as to plan for training activities for the following year. Assessment results are shared with relevant stakeholders, including the licensing authority and the community geriatric teams of public hospitals which provide outreach personal medical care to residents of RCHEs. Feedback is also provided to RCHE staff, to increase their alertness and encourage improvements. This study aimed to review the 10-year trend in infection control practices in RCHEs in Hong Kong, based on results of the annual VHT assessments conducted from 2005 to 2014. Assessment of all RCHE facilities, and the infection control knowledge and skills of staff are conducted annually via structured questionnaires and observational checklists. 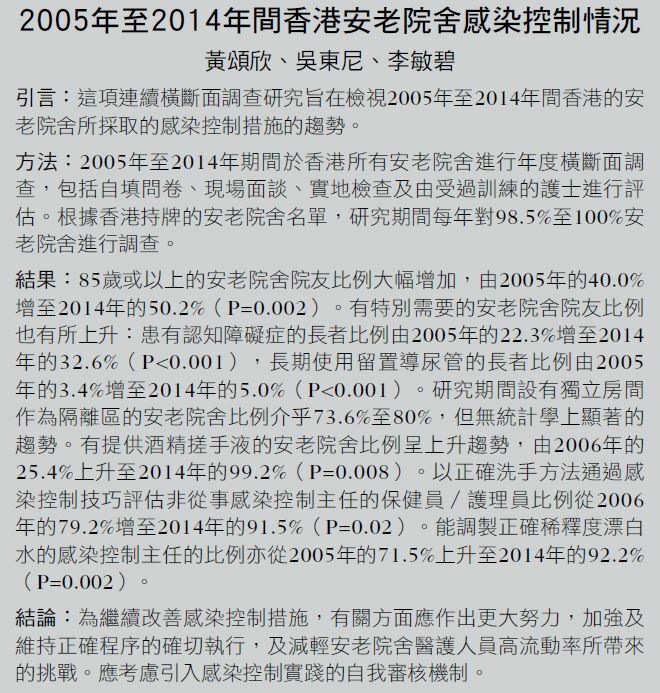 The annual surveys cover all RCHEs in Hong Kong from 2005 to 2014, based on the lists maintained by the licensing authority.4 The coverage rate was 98.5% to 100% from 2005 to 2014. A few RCHEs were not covered because they were either non-operating (under renovation or recently closed) or refused the VHT service. These RCHEs were excluded from analysis. Part I: The characteristics and profiles of residents and staff of the RCHEs, including the subjective training needs of staff, were collected through a self-administered questionnaire (online supplementary Appendix) completed by the person-in-charge of the RCHE, prior to the site visit by the VHT. Part II: The environmental conditions and facilities related to infection control in RCHEs were assessed by a VHT nurse during the site visit. Part III: The health monitoring and record keeping practices in RCHEs were assessed during the site visit. Part IV: The knowledge and skills on infection control of staff in RCHEs were assessed in face-to-face interviews during the site visit. The ICO (or other staff, depending on the topic being assessed) of each RCHE was assessed. An additional member of staff (either a health worker or care worker) was also selected at random for assessment on hand washing technique. The age profile of the residents in RCHEs from 2005 to 2014 is shown in the Figure. An apparent ageing trend is observed with the proportion of RCHE residents aged ≥85 years rising from 40.0% (23 718) in 2005 to 50.2% (31 149) in 2014 (P=0.002). Table 1 shows the percentage of residents with special care needs from 2005 to 2014. The proportion of residents with dementia increased from 22.3% in 2005 to 32.6% in 2014 (P<0.001). The percentage of residents with a long-term indwelling urinary catheter increased from 3.4% in 2005 to 5.0% in 2014 (P<0.001), representing a 47% increase in the number of patients with a long-term indwelling urinary catheter. The resident-to-staff ratios in RCHEs from 2005 to 2014 are shown in Table 2. The major types of staff in RCHEs in Hong Kong are professionally qualified nurses (including registered nurses and enrolled nurses registered under the Nursing Council of Hong Kong), health workers who have completed basic training recognised by the licensing authority, care workers who have not received any official training, and other staff including allied health and supporting staff. There were no significant changes in overall resident-to-staff ratio over the study period. For nurses and health workers, the overall manpower ratios improved from 30:1 and 27:1 in 2005 to 23:1 and 17:1 in 2014, respectively (both P<0.001). Increases in numbers of full-time and part-time nurses and health workers contributed to the improvements in these ratios. There was an observable difference in terms of the number of nurses between private RCHEs and non-private RCHEs. In 2014, the resident-to-nurse ratio was 58:1 in private RCHEs compared with 11:1 in non-private RCHEs. In fact, the majority of private RCHEs (70.9%) did not employ any nursing staff. In contrast, only 3.8% of non-private RCHEs did not have any nursing staff. Only 18.5% of private RCHEs had assigned nurses as ICOs, whereas the percentage was 93.0% in non-private RCHEs. The rest of the RCHEs appointed health workers as ICOs. The RCHEs are collective living places where communicable diseases can easily spread through contact with the environment. Therefore, it is essential for RCHEs to be equipped with proper facilities to prevent outbreaks. After years of promotion, the proportion of RCHEs with alcohol hand rub increased significantly from 25.4% in 2006 to 99.2% in 2014 (P=0.008), as shown in Table 3. Nevertheless, further examination of a selected bottle of alcohol hand rub at each of the RCHEs revealed that, in 2014, only 92.4% of RCHEs had alcohol hand rub that had proper concentrations and were within the expiry dates. Although this was an improvement from 64.1% in 2008, a difference in performance was observed in 2014, with only 90.7% of private RCHEs having proper alcohol hand rub, compared with 97.3% of non-private RCHEs (P=0.003). According to the COP for RCHEs,2 an isolation facility is a basic requirement for an RCHE and is defined as “a designated area or room with good ventilation, adequate space for equipment for proper disposal of personal and clinical wastes, and basic hand hygiene and hand-drying facilities as well as electric call bell.” The proportion of RCHEs equipped with a designated room as an isolation area for fever cases ranged from 73.6% to 80.0% between 2005 and 2014. No obvious trend was observed. In 2014, 19.9% and 0.8% of RCHEs were still only able to provide fixed boards of either three-quarters or half the height of the room, respectively, as partitions for the isolation area instead of providing separate rooms (Table 3). More non-private than private RCHEs were able to designate a separate room for isolation in 2014 (90.3% vs 73.3%, P<0.05). However, of the rooms designated as isolation areas, 1.5% in non-private RCHEs and 5.3% in private RCHEs were found to be occupied by residents without the need for isolation, or used for storage. For contact tracing and outbreak investigation, a proper record system is essential. Only 60.3% of all RCHEs kept proper visitors’ record in 2005, increasing to 92.1% in 2014. There were also moderate improvements in the maintenance of sick leave records for staff, fever records for residents, and training records on infection control for staff, as shown in Table 3. However, a statistically significant trend could not be identified. The ICO’s skill at hand washing, wearing and removing of personal protective equipment, and preparing bleach solution for environmental disinfection were tested in each RCHE. In addition to assessing the ICO, a health worker or care worker was also selected at random for hand washing technique auditing. The proportion of ICOs with proper hand washing technique increased from 86.7% in 2005 to 96.9% in 2014, although a statistically significant trend was not observed (P=0.14). However, an improvement trend was observed for non-ICO health/care workers from 79.2% in 2006 to 91.5% in 2014 (P=0.02) [Table 3]. The proportion of ICOs with proper skills on wearing and removing of personal protective equipment ranged from 80.7% to 88.9% between years 2006 and 2014 (P=0.27). The proportion of ICOs who were able to prepare bleach solution with the proper concentration showed an improving trend from 71.5% in 2005 to 92.2% in 2014 (P=0.002). Infectious disease outbreaks are major concerns for RCHEs as they often lead to significant morbidity and mortality. Local data on infection control practices among RCHEs are limited. The current study is the first institution-based serial survey on the trend of infection control practices among RCHEs. Residents of RCHEs are often functionally impaired, putting them at higher risk of infection.10 Our results show that the proportion of RCHE residents aged ≥85 years is increasing (Fig). This is expected to result in increased prevalence of co-morbidities and functional impairment, leading to further infection control challenges. There have been improvements in infection control practices among RCHEs over the study period from 2005 to 2014, in terms of manpower, facilities, practices, knowledge, and skills. The improvement was most obvious in terms of manpower and facilities. More nurses and health workers were recruited into RCHEs, and common areas equipped with alcohol hand rub. There was also a 10.2% improvement in hand washing skills and a 5.9% improvement on skills of wearing and removing of personal protective equipment among ICOs during the study period (Table 3). Possible contributory factors to such improvements may include the overall increased level of awareness on the importance of infection control, increased availability of manpower11 12 13 and financial resources, and improved access to infection control training programmes. Despite the improvements in infection control, there are some areas of concern that are worth noting. First, there was a sharp initial increase in the number of RCHEs that had separate rooms as isolation areas in 2004. This was likely an enhancement measure in response to the SARS outbreak in 2003. However, the proportion of RCHEs with separate isolation rooms has remained stable at around 70% since then, despite ongoing training and education. Possible explanations for this plateau include lack of space, other competing demands, and other resourcing issues. A similar plateau effect was also observed for knowledge and skills on infection control measures. The RCHE staff’s knowledge on the assessment items significantly improved (to near 90% for most topics), then showed little further improvement. Second, it was not feasible for us to interview all staff during our site visits, because the RCHEs must maintain routine service for residents. During site visits, we assessed the knowledge and practice of only the ICO and one additional health or care worker. The performance of these two selected workers might not be representative of all staff of the RCHE. Third, to enhance comparability of assessment results, most questions asked and skills tested were similar between years. Thus, the assessment content might become predictable as the assessments were repeated annually. This might have led to survey fatigue and inability to capture true performance. With an increasingly frail and ageing cohort of residents, RCHEs are expected to face a growing risk of infectious disease outbreaks in the coming decades, especially those involving multidrug-resistant organisms. Other than general infection control measures already adopted by the RCHEs, having a stable and well-trained workforce will become an increasingly important factor in determining the success of RCHEs in combating infectious diseases, especially as the number of elderly residents with special care needs (such as those with indwelling urinary catheters or on nasogastric feeding) is rising. Manpower planning, development, and staff retention will remain a challenge for infection control. Moreover, as knowledge and skills on infection control have stopped improving, training on infection control should emphasise encouraging sustainability of vigilant practices. Measures including self-auditing on infection control should be considered, to encourage RCHE staff to monitor their own infection control performance on a regular basis, between annual external assessments. This is the first territory-wide report on trends in infection control performance in RCHEs in Hong Kong. Data collected enabled us to understand the strengths and limitations in RCHEs on infection control, thus allowing stakeholders to design more targeted infection control training programmes. Knowledge and skills on infection control have reached an adequate level and remained stable. Future infection control training should aim to support sustained compliance with proper practice, through introduction of elements such as self-audits. Concept or design: GCY Wong, T Ng, T Li. Acquisition of data: GCY Wong. Analysis or interpretation of data: GCY Wong. Drafting of the article: GCY Wong. Critical revision for important intellectual content: T Ng, T Li. The authors have disclosed no conflict of interest. The report was funded by the Department of Health, Hong Kong. A waiver for ethical review was endorsed by the Ethics Committee of the Department of Health, Hong Kong. 1. Census and Statistics Department, Hong Kong SAR Government. 2016 Population By-census. Thematic report: older persons. Available from: https://www.bycensus2016.gov.hk/data/16BC_Older_persons_report.pdf. Accessed 8 Jan 2019. 2. Social Welfare Department, Hong Kong SAR Government. Code of practice for residential care homes (elderly persons). Available from: http://www.swd.gov.hk/doc/LORCHE/CodeofPractice_E_201303_20150313R3.pdf. Accessed 8 Jan 2019. 3. Department of Health, Hong Kong SAR Government. Guidelines on prevention of communicable diseases in residential care home for the elderly (3rd edition). Available from: https://www.chp.gov.hk/files/pdf/guidelines_on_prevention_of_communicable_diseases_in_rche_eng.pdf. Accessed 8 Jan 2019. 4. Social Welfare Department, Hong Kong SAR Government. List of residential care homes. Available from: https://www.swd.gov.hk/en/index/site_pubsvc/page_elderly/sub_residentia/id_listofresi/. Accessed 8 Jan 2019. 5. World Health Organization. WHO guidelines on hand hygiene in health care. Available from: http://apps.who.int/iris/bitstream/handle/10665/44102/9789241597906_eng.pdf?sequence=1. Accessed 8 Jan 2019. 6. Audit tools for monitoring infection control guidelines within the community setting. Bathgate, UK: Infection Control Nurses Association; 2005. 7. Routine practices and additional precautions in all health care settings. Canada: Provincial Infectious Diseases Advisory Committee. Ministry of Health and Long-Term Care; 2009. 9. Social Welfare Department, Hong Kong SAR Government. SWD elderly information website. Type of residential care homes. Available from: https://www.elderlyinfo.swd.gov.hk/en/rches_natures.html. Accessed 8 Jan 2019. 14. Hong Kong SAR Government’s response to a question raised by a Legislative Councillor on 11 January 2017. Available from: https://www.info.gov.hk/gia/general/201701/11/P2017011100501.htm. Accessed 28 Jan 2019. 15. Research Brief Issue No. 1 2015-2016, Research Office, Legislative Council Secretariat, Hong Kong. Available from: https://www.legco.gov.hk/research-publications/english/1516rb01-challenges-of-population-ageing-20151215-e.pdf. Accessed 8 Jan 2019.